We’re transitioning Magnum to trailing as he ages. Although trailing is harder mentally on the dog, it’s not as hard physically. Magnum is mature enough to handle the mental change. We did the same thing with Sierra as she got older. K9 Magnum with his older sister Sierra. On Tuesday, we responded to a search outlined in this article in the Kitsap Sun. After being given a scent article, Magnum walked across the street from the man’s house, and then slowly out to Central Valley Road. Once there, he didn’t take a direction. We checked both sides of the road, and in both directions. Then we checked a side street that went west. Nothing. Zip. Nada. I was a little disappointed, but we instead worked the ditches along a route that the subject had taken during one of his previous unaccompanied forays. When the subject was found, some distance away, I had occasion to ask a very experienced bloodhound handler what her dog had done after being given the scent. “He went across the street, wound his way to Central Valley and then didn’t take a direction.” The exact same thing Magnum had done. I was feeling sort of bad that Magnum hadn’t jumped on the trail and followed it. But if the bloodhound also struggled, then it can be forgiven. A small victory, or at least not a major failure. We’ll probably never know whether the non-verbal subject somehow hitched a ride in a car to his destination, which would explain why his trail disappeared up at Central Valley. That seems unlikely given that he left about 1am, but is possible. This video is making the rounds on social media, and is certainly an example of a K9 hero. 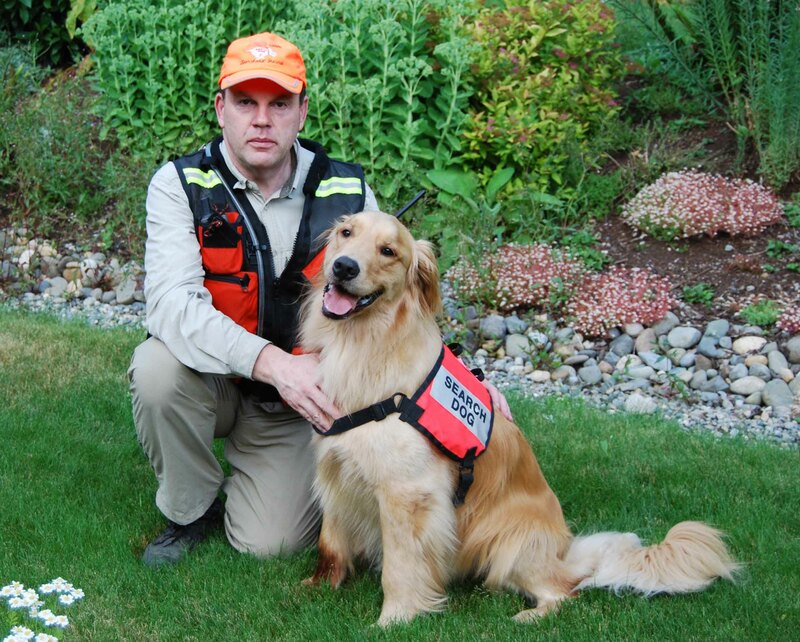 But for those of us with an interest in K9 SAR, this deputy does a great job of describing his dog’s body language. The reporter probably doesn’t even click to what great information the deputy is passing along for those of us in the biz. Video: WBNS TV, Ohio, story on police K9. The deputy notes ear position and even breathing pattern, and correctly deduces that the dog is tracking because it ignores a firefighter. All those facts and more led him to believe his dog was on the right track. A good handler knows his dog this well. Yes, they CAN learn new tricks. 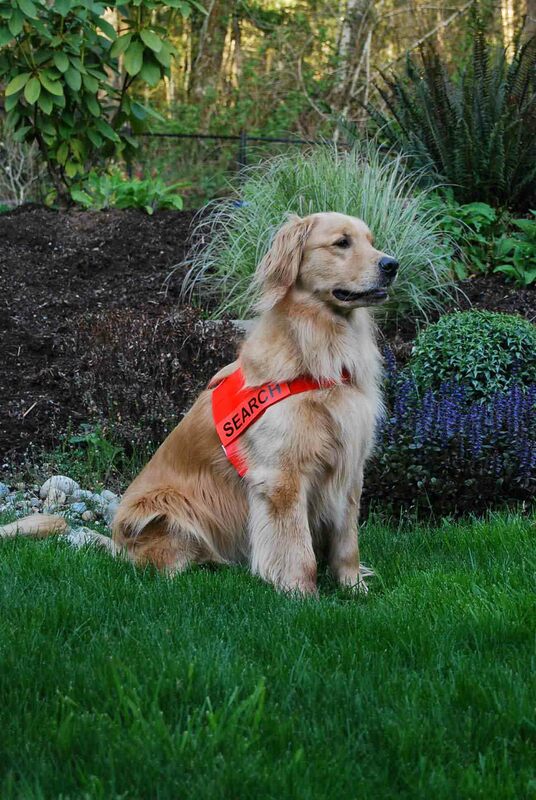 Sierra’s younger brother Magnum, who at age 9 is still a working SAR dog. If you’ve taken a dog to obedience class, you’ve heard the instructor say “dogs don’t generalize.” That’s a fancy way of saying if you teach the dog something in one environment, they might completely forget the command in another environment. The dog that did perfect sits and downs in obedience class is a complete spaz at the vet. 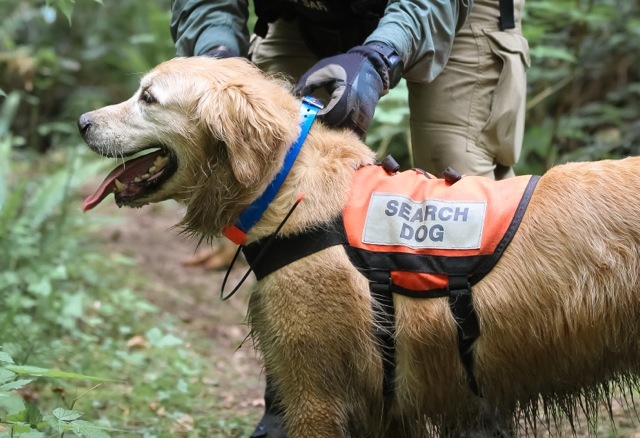 Most handlers expose our search dogs to as many conditions as possible, so that they will know (& remember) how to search regardless of where they are. Nowhere was that borne out more than in the 2014 search at the SR 530 Mudslide in western Washington. Most of the local dogs that responded were wilderness dogs, with some exposure to rubble. FEMA dogs came in with lots of exposure to rubble, but less so to wilderness. Both groups were thrust into an environment where wilderness and physical structures had been tossed into a mixmaster. Neither group of dogs had searched in exactly that environment: building rubble mixed with mud, seasoned with nails and sharp sheet metal. What was amazing and gratifying is that the dogs adapted much faster than experts have said they would. My Magnum (Sierra’s younger brother) is a wilderness dog. When we got the opportunity to search at Oso I took him to a big pile of debris. He immediately hopped off and went over to the brush on the edge of the slide area. That’s because he’s used to finding subjects in the brush. “Hey Magnum, we’re searching over here today.” He came back to the pile and we never had to discuss it again. I’m told that virtually every other dog adapted that quickly. We taught something to the experts during the Oso response. Old dogs can learn new tricks. 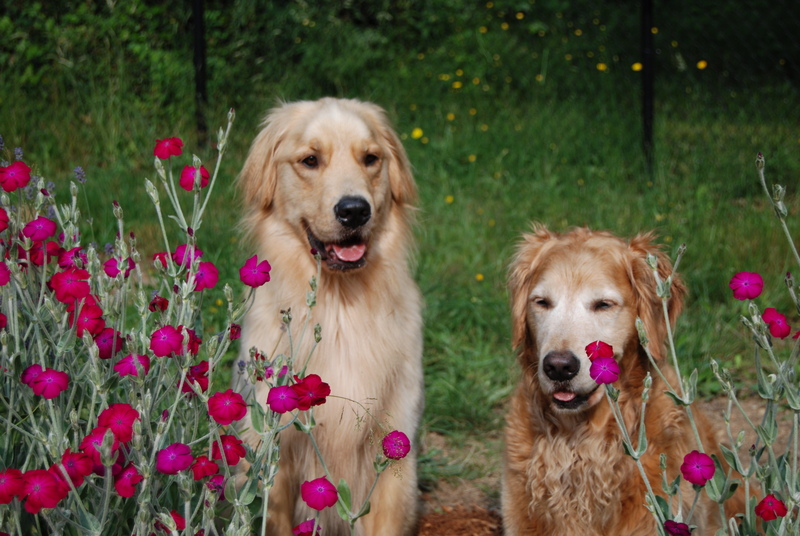 What none of us could have guessed is that the dogs could learn those tricks in real time, while doing them. Not every missing subject wants to be found. No bell, buddy Magnum. I’ll track you with your GPS collar but we’re in stealth mode today. That’s going to be a real “duh” to my police friends, who are used to hunting for criminals. But not every missing person wants to be found, either. That’s harder than it sounds in most western Washington underbrush. You can limit the crunching of the brush by stepping carefully, but it slows you down. For those of us who are cussers, stifling the naughty words is hard when you find a big ol’ blackberry branch popping up between your legs. It’s a bullet we take for the team. All kidding aside, my friend Kathy had a successful find earlier this year on a subject with Asperger’s Syndrome who was actively trying to elude her. She’s a class act, and prior experience with Asperger’s made her able to work with the subject once her dog arranged the introduction. Dogs have us beat in more than just the nose department. Their ears are also more sensitive than ours, and better yet they’re more directional. When conditions are just not right for finding someone with scent (hot, no wind) we switch to what are called Voice Checks. The dog is placed in a sit and given the command “Listen.” The handler then calls out the missing subject’s name at the top of their lungs and watches the dog’s head. If the subject responds the dog’s head will snap in the correct direction. Most dogs will then take off after the subject and eventually get close enough to smell them. Sierra took this one step further. She quickly figured out what was expected, and when she heard the “Listen” command she’d hold her breath so the sound of her panting wouldn’t drown out a response. That amazed me. How on earth would you ever teach a dog to hold its breath? Obviously this only works if the missing subject is conscious, alert and wants to be found. If you start doing this on cadaver searches, you’re going to get some funny looks. And not everybody wants to be found. In our next episode: Stealth Mode! When I left the State Patrol to write, some of you asked me to blog about the world of writing. This blog is mostly about the dogs, but let me take a moment to update you on the fun new world I’m exploring. Writing is easy. Publishing is hard. I am assembling a “rock star” support team of consultants to help me navigate the waters. Not cheap, but rookie mistakes could be even more expensive. The biggest thing I’ve had to learn is to promote my book while it’s still being written. That feels like selling a promise, and initially left me uncomfortable. But I suppose if I wait until the book is completely written, there could be a lag time before the marketing has an effect. I’ve also had to get back on a schedule, just like I was working. It’s not that I’ve been goofing off, I’m busy all the time. Most everything was getting done, but sometimes high priority tasks got bogged down behind other stuff. It just felt disorganized. And as of this writing, I’m still looking desperately for an illustrator. 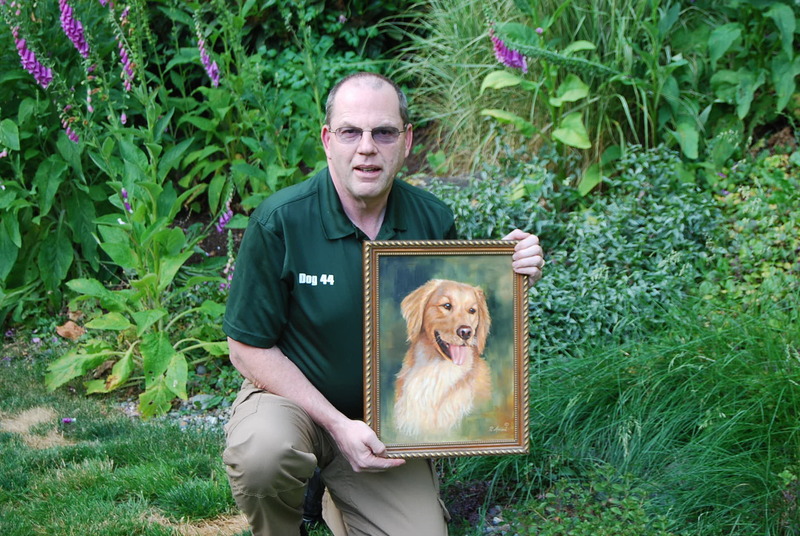 If you can draw cartoonish images of dogs, I’d like to see your stuff. The good wishes have been flowing in, many of them saying “congratulations on your retirement.” I appreciate the kind thoughts, but I’m not retired. I left daily employment to earn a living by following a passion. With a month under my belt, I know it was the right move and I’ll encourage you to follow your dreams as well. Everyone’s been so nice. I hope you’ll be this nice when you see me approaching with a stack of books to sell you. I promise not to be a pain in the rear.